Image of the area around the landing site of NASA's Phoenix Mars lander, captured by NASA's Mars Reconnaissance Orbiter in July 2008. The lander is near the top, and the back shell and parachute are close to the bottom. The dark patch at right was created by the impact of Phoenix's heat shield. The Martian elements are coming for NASA's Phoenix lander. A newly released photo suggests that dust is reclaiming the site near the Martian north pole where Phoenix touched down nearly 10 years ago. 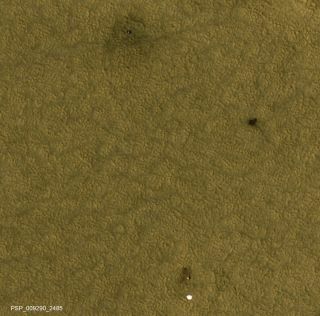 "The Phoenix lander itself, plus its back shell and parachute, are still visible in the image taken Dec. 21, 2017, by the High Resolution Imaging Science Experiment (HiRISE) camera on NASA's Mars Reconnaissance Orbiter," NASA officials wrote in a description of the photo, which was released Tuesday (Feb. 20). "But an animated-blink comparison with an image from about two months after the May 25, 2008, landing shows that patches of ground that had been darkened by removal of dust during landing events have become coated with dust again," they added. Phoenix's mission was supposed to last 90 days, but the solar-powered lander kept operating in the frigid Martian north for more than five months, finally falling silent as winter took hold in November 2008. Phoenix studied the Red Planet soil and atmosphere using several different instruments. The lander also confirmed the existence of water ice just below the Martian surface, in a shallow trench dug by its robotic arm. This GIF blinks between two images of NASA's Mars Phoenix Lander hardware taken by the agency's Mars Reconnaissance Orbiter in July 2008 and December 2017, respectively. In the latter photo, dust obscures much of what was visible two months after the landing. The lander is near the top, and the back shell and parachute are close to the bottom. The dark patch at right was created by the impact of Phoenix's heat shield. Though Phoenix is long dead, the Mars Reconnaissance Orbiter (MRO) is still going strong after nearly a dozen years at the Red Planet. The $720 million mission launched in August 2005 and arrived in orbit around Mars in 2006. Since then, MRO has been performing a variety of tasks, such as searching for signs of past water activity on the Red Planet; scouting out promising sites for future landed missions, both robotic and crewed; and relaying data from surface craft such as Phoenix and the Opportunity and Curiosity rovers back to their handlers on Earth. MRO's HiRISE camera, which took the newly released photo, can resolve features as small as a coffee table on the Martian surface. HiRISE has photographed Opportunity and Curiosity from orbit. And, in early 2015, NASA announced that the instrument had found the European Space Agency's Beagle 2 lander, which had been missing since its December 2003 touchdown on the Red Planet.